alaTest a collecté et analysé 14 avis de consommateurs et d'experts pour le produit Logitech MK100. La note moyenne du produit est 4.8 sur 5, tandis que les autres produits de même catégorie ont une note moyenne de 4.1 sur 5. Les testeurs apprécient le design. Le rapport qualité/prix impressionne, mais les testeurs sont moins positifs sur la qualité de construction. Après analyse des notes de consommateurs et d'experts, de l'âge du produit ainsi que d'autres facteurs, et comparé aux autres produits de même catégorie, le Logitech MK100 obtient un alaScore™ de 85/100 = Très Bien. From now on I will only accept things from New-Egg that ship from California, or China, VIA YOLO Trade. I needed a spare USB keyboard and mouse for a Raspberry Pi. This was a perfect solution at a great price. If you need a spare keyboard and mouse that may not be top of the line but works wee and is inexpensive, this will do it. I bought this for my hobby of rebuilding PC's because you can't use USB until the OS is completely installed and I only had wireless mice and keyboards. Works great and the keyboard is very comfortable to use. 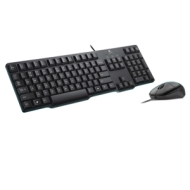 the keyboard is not a usb connector, but I am lucky that I am using it on desktop unit, but the description is wrong, the mouse is usb, quality is ok, but this price nothing you can say. but just make sure you has ps2 for the keyboard. Very good items for the price.